In the mid-1960s, a young man named Jim Vrabel left his home in Central Massachusetts and moved to Boston to attend Northeastern University. Technically, he was an English major, but Boston, and its history, became the real focus of his studies, launching him on a lifetime study of the city that would eventually morph into a project whose scope was so epic, so unprecedented, that now, decades later, he is not sure what to do with it. Or, more specifically, where to put it. Vrabel has documented, catalogued and sorted nearly every significant moment in Boston’s history. All of it. In chronological order. From 15,000 B.C. (when the topography of Boston is created by the thawing of the Laurentide Ice Sheet), to the news of today (Boston Latin seventh-grader Mira Yu wins the citywide spelling bee). His “Boston History Database” now includes entries on 18,000 significant events, 17,000 buildings, and 6,000 inanimate objects – things like books, movies and paintings. It is all compiled neatly into a database, built with the help of a retired MIT software engineer named Dennis McCarthy, that is able to be searched, sorted, and reassembled in a myriad of clever ways, meaning you could quickly create a timeline of every significant event that happened on a particular street, from A Street in South Boston to Zamora Street in Jamaica Plain. In 2004, Vrabel, who spent a quarter-century working in various capacities in City Hall, published an abbreviated version of his research in a book called “When In Boston: A Time Line and Almanac.” The book has become a well-thumbed resource for reference librarians and journalists, but he said the problem with a book is that it is static. It just sits there; it never changes and grows. But history does. Vrabel never stopped adding to his timeline. The problem is that the project, which has grown tenfold since he published the book, lives entirely on his home computer and nowhere else. This has proven easier said than done. He envisions a curated electronic shape-shifting multimedia encyclopedia of Boston history overseen by an editorial board, and hosted by an established institution. He has approached every potential institution he can think of, he said. 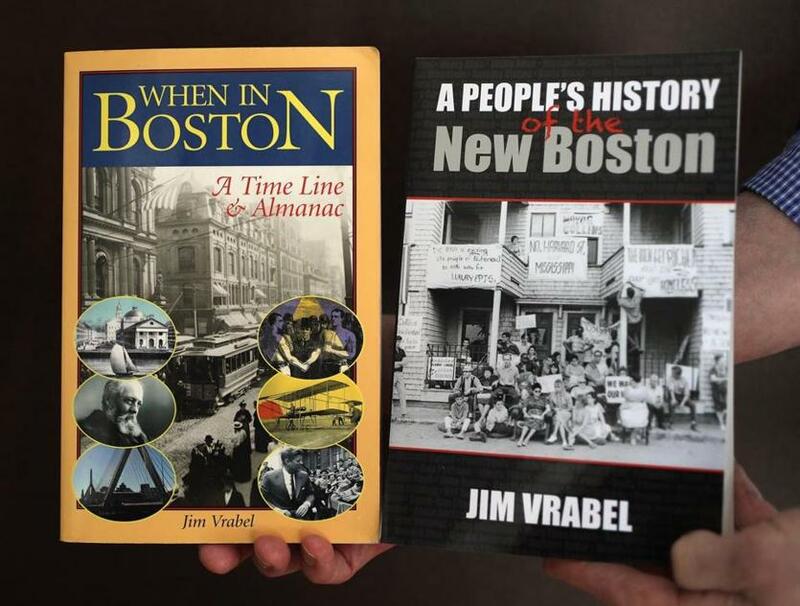 Jim Vrabel's two books are "When In Boston" (published in 2004) and "A People's History of the New Boston" (2014). There is certainly a cost involved. He estimates it will take about $25,000 to create an interactive website, and another $10,000 a year to keep it running, plus a long-term curatorial commitment. But the content is there, and he argues that Boston, for all its history, is bad about sharing it. Most of the entries are limited to a paragraph or two, and he tries to stick strictly to the facts because he wants people to string those facts together in their own way, with their own context and narrative. Until the day comes when he can find an institution to take over, Vrabel will continue to add and add to the timeline. The history of Boston today. And whatever happens tomorrow.